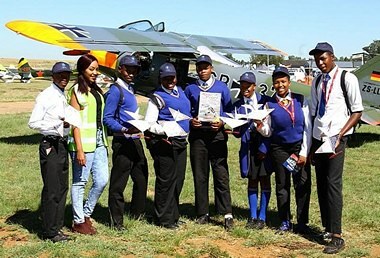 The Aero Club of South Africa organised and hosted a very successful Airweek at the Parys airfield over the weekend of 10th to 12th March 2017, the weather turned out to be absolutely perfect for the end of the summer season. 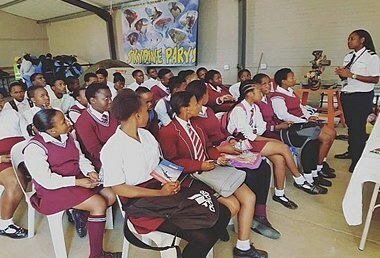 The objective of the Aero Club to organise and host such an Airweek was to raise awareness of recreational aviation in South Africa and an opportunity for all the sections of the Aero Club to network and mingle with each other. Aero Club Organisers Richard Becker, Sandra Strydom & Chandre Steenkamp were already busy with setting up the field on Thursday to get the barriers, sound system and exhibitors areas marked out. The busy parking line-up on Saturday Morning. Some aviators already descended onto the field on Friday during the day to set up camp, even though they had a freezing night in their tents as the last remnants of the cold front passed through. Saturday morning proved to start out as a clear day with pristine flying conditions, albeit a bit windy initially which, enticed many flyers to take to the skies towards Parys early on. The Gyro Line-up. The Air waves were hectic before 8 am on the Parys airfield frequency with incoming traffic (ATC only came on line at 8), thus it was challenging for everybody to get to suitable separation in the circuit. Fortunately 06 was in use so that landing aircraft could clear the runway fairly quickly. Once the ATNS team were in place, accompanied by safety office Nigel Musgrave and ground controller Paul Sabatier, they all did a sterling job to ensure a safe and memorable event. The busy exhibitors' row. Soon, the aircraft parking area became full, and at the last count more than 120 aircraft arrived including; balloons, gyrocopters, aerobatic aircraft, powered paragliders, microlights, gliders, light sport aircraft, helicopters, vintage and veteran aircraft and so many variations of type and non-type certified aircraft, amazing to see all that aviation diversity in one place. 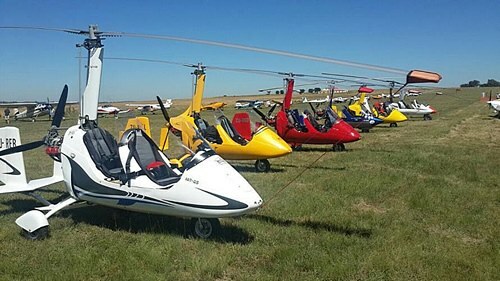 From the turnout over the 3 days, this weekend was an incredible indication that sport and recreational aviation in South Africa is alive and well. The organisers were caught off guard with such a very high turnout, so had to make additional plans for additional catering, but this was a good problem to have to solve. The microlights preparing for their turn at spot-landing. Activities throughout the day was well choreographed, starting off with the SAPFA spot landing competition, which when it started had the wind at least on runway 24 which is much more spectator friendly to see how close the competitors could get to land on the line. The format was loosely based on precision landings with two circuits, one being a powered approach with any selection of flap and the second approach had to be a glide approach with a power cut abeam the line at circuit altitude. There were twelve competitors, which was a good turnout for such an event, ranging from microlights to the fast Saratoga. Flights were organised in groups of three aircraft to keep spacing in the circuit. The competition was won by a previous world landing champion Ron Stirk in his C150, followed by Marcel Griffioen in a Pipistrel Sinus (both were tied on 22 points but Ron's glide won the day). Alan Evan-Haines was third in a Super Cub and Rob Jonkers fourth in a C182 (both also tied with 150 points, but Alan's glide won his day). Frank Eckard, current world landing champion was in fifth place. Throughout the day the skydivers were very busy, Graham Field the guru of skydiving from Rustenburg taking up many tandem jumpers to introduce them to the sport. A landing zone was specially marked out for the jumpers near the skydiving clubhouse and was a popular photo spot to catch them on their landing antics. 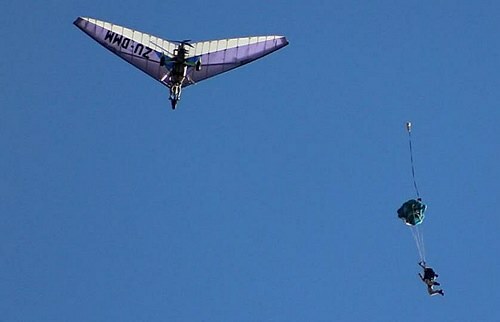 Graham Field parachuting from a microlight. In the early afternoon there were a number of glider releases above the field to show off the gentle and quiet art of soaring. This was followed by some spectacular "mock" aerobatic competition demonstrations with a wide range of aircraft taking part from a heavy Boeing Stearman to the nimble short-winged Pitts Special. Just the day before, a seminar on aerobatic judging was held to train a new crop of judges, who then judged these mock display sequences, their scores being evaluated by the experts. Another up and coming sport is drone racing, and just adjacent to the parachute landing zone a drone racing circuit was set up, which is laid out grand-prix style with chicanes, turning bollards and hoops. The Drone Racing pilots - Photo Athol Franz. The pilots all wear FPV (First Person View) headgear and fly small quadcopters fitted with a camera which is video fed to the headset. The pilot then sits in a comfortable chair and attempts to fly Star-Wars X-wing style the circuit as accurately and as fast as possible, the winner decided on a both these criteria. Watching these little machines dance around can make one easily seasick, the speed they achieve is easily 60 kms/hr on the straights with high G manoeuvres around the corners. Needless to say this became a popular place on the airfield to hang out and watch. 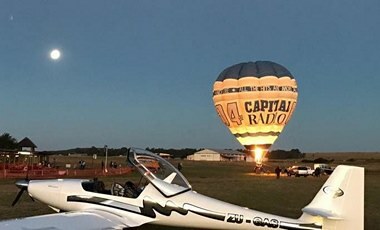 The Epic Aviation paragliders take to the air in the late afternoon�� Balloon nightglow under the rising full moon - Epic! 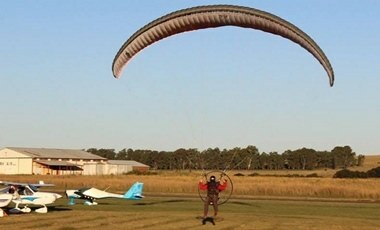 As evening approached, the wind virtually disappeared, and it was the turn of the Epic Aviation paragliders to take to the air to show how their powered paragliders could manoeuvre around the airfield, the weather being so calm they flew as much as the ambient light would allow. At the same time, also taking the advantage of calm air the Sport Balloonists got their burners roaring for a nightglow spectacle showing off their bright coloured balloons. Master of Ceremonies Karl Jensen and Daniel Ralefeta preparing for his talk on Commercialisation of Drones. While the flight activities were happening all over the field, a number of technical forums were well organised by Karl Jensen in the skydiving clubhouse with a number of speakers taking the stage. Tony Frost shared the outcome of the recent Aero Club strategy session held describing Vision 2032 as a 15 year forward looking view on Recreational Flying in South Africa, given that the Aero Club's Centenary is coming up in 2020, and a good time to be thinking about the future for our diverse aviation heritage. The Vulcan Bomber. Colin Francis gave a very impassioned talk on the development and use of the Vulcan Bomber during the cold war period and its success in the Falklands war in the 1980's, especially the logistic challenges of deploying these aircraft so quickly and so far to achieve a successful bombing strike of the main runway of Port Stanley. Daniel Ralefeta gave an overview on commercial application of drones, which is an ever increasing activity given the prolific number of drones being CAA registered for commercial use. He is also involved in the training and legislative aspects of drone use, as the education of users are becoming critical to ensure safe use of drones in various applications. Daniel Ralefeta with the youth development group. Next door to the skydiving clubhouse is the hangar and training area and this was set-up for the Transformation & Development activities happening throughout the day, also hosted by Dan Ralefeta who is the current Aero Club T&D chairperson. 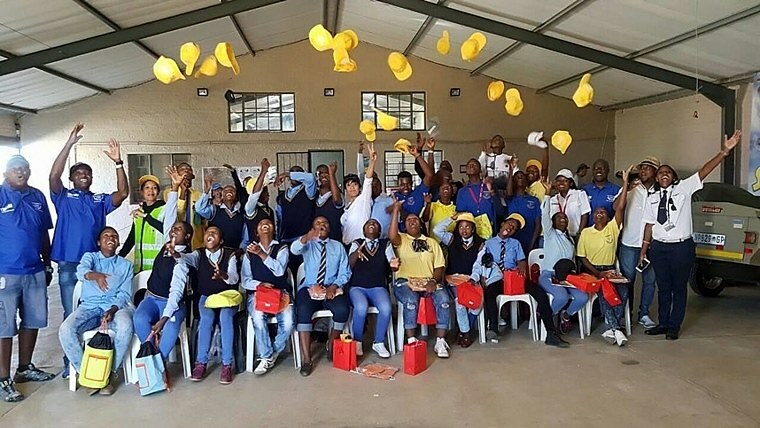 School children from the local community were treated to a number of activities, building delta darts under the tuition of SAMAA members, attending a talk of inspiration by Tumi Katisi who is under training to become an airline pilot. 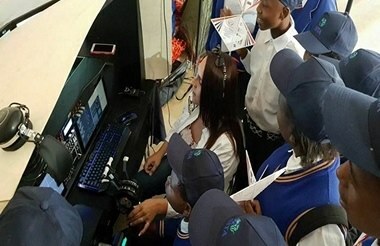 A replica Boeing 737 simulator cockpit was also on hand, where owners Pieter Kriel and Adrienne Visser first gave the children an introduction to the basics of flying controls and how they affect the aircraft's movement in the air. Thereafter they were offered to try their hand at taking off, flying a circuit and landing a simulated Cessna 172, which gave them the ultimate experience short of the real thing to control an aircraft. And so came an end to the successful Airweek, some die-hards who overnighted in their tents were treated to a bonfire at the Skydive Club and Aero Club organised braai, some took in and early night with others chilling in the warmth of the boma till late. 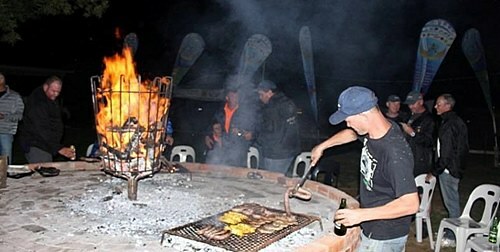 Saturday Night Braai time. The Aero Club would like to thank all the helpers and supporters for making this event successful, Comav (for the sponsorship of the vests and caps), SACAA (for sponsorship received), Skydive Parys (for hosting Airweek at their clubhouse facilities), Montgolfiers Restaurant (for their catering service - with regret to also announce that Oom Fanie passed away on Sunday the 12th). The exhibitors were The Airplane factory, Air Adventure Tours, Safomar, Aviation Direct, Century Avionics, PJ Aviation, Comav, Epic Aviation, Fly by Wire Aviation Art, Slush Puppy, Mobi Caf�. 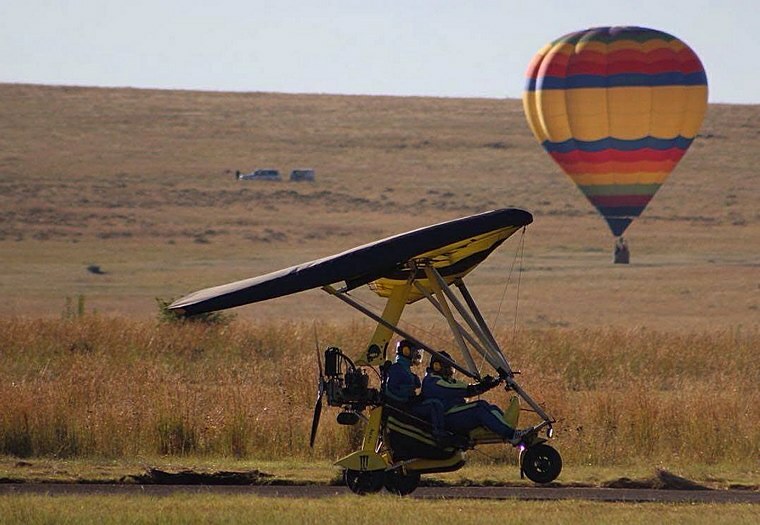 Sunday morning saw some early risers taking advantage of the pristine weather to take flight on some scenic areas around Parys, before the rest surfaced for breakfast to pack up and return to home base. For sure, everyone will be looking forward to next year!